After reclaiming the division lead, the Minnesota Wild look to create some breathing room in the tight Northwest race and clinch a playoff berth on Friday night as they host the Vancouver Canucks. The Wild (41-28-9) lead the Northwest by one point over idle Calgary and three over Colorado, which hosts Edmonton on Friday. Minnesota is coming off a split of a home-and-home series with last-place Edmonton. The Wild scored on two of their first four shots Wednesday in a 3-1 win over the Oilers, two days after a 5-3 loss in Edmonton had dropped them one point behind Calgary for first place. "It puts us back where we want to be," said Wild left wing Brian Rolston, who netted a short-handed goal Wednesday. "And the next game gets bigger and the next game gets bigger and the next game gets bigger." The Wild and the Avalanche each have four games remaining, one fewer than the Flames. Minnesota has been jockeying with Calgary and Colorado atop the division all season, and has home games against the Avs on Sunday and the Flames next Thursday before wrapping up the regular season in Denver on April 6. While winning the division would give the Wild the No. 3 seed in the conference, they can at least be assured of a playoff spot for the second consecutive season if they win Friday while ninth-place Nashville loses at Columbus. Minnesota holds a 4-2-1 advantage on the Canucks (38-29-10) in the season series. Wild goaltender Niklas Backstrom is 5-0-1 with a 2.09 goals-against average in his last six starts against them. Backstrom made 30 saves in a 2-1 win at Vancouver last Friday, but was pulled early in the second period of his next start as he gave up three goals on 10 shots against Edmonton on Monday. He bounced back to make 32 saves in Wednesday's win, and has not given up more than three goals in 13 straight starts. Vancouver is hoping to avoid a season high-tying fourth consecutive loss after falling 6-3 at Colorado on Wednesday. The loss dropped the Canucks into eighth place in the West, two points behind the seventh-place Avalanche and only two ahead of the Predators. Vancouver now hopes to close a three-game road trip on a positive note before returning to GM Place for its final four regular-season contests. 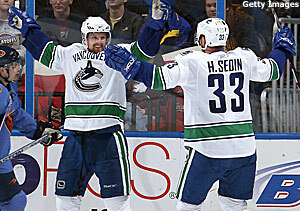 Despite the slide, the Canucks are getting strong production from twin brothers Henrik and Daniel Sedin. Henrik Sedin has two goals and five assists in the last five games, while Daniel Sedin has three goals and four assists in that span. The duo totaled a goal and eight assists in the previous 12 contests. Henrik Sedin setup Daniel Sedin's overtime goal in a 3-2 win at Minnesota on Feb. 19 - the last time the teams met at Xcel Energy Center.